Marko Arnautovic produced a memorable performance to inspire West Ham to a 3-1 win over Southampton. “How good would Arnie be if he played against a Mark Hughes side every week?". 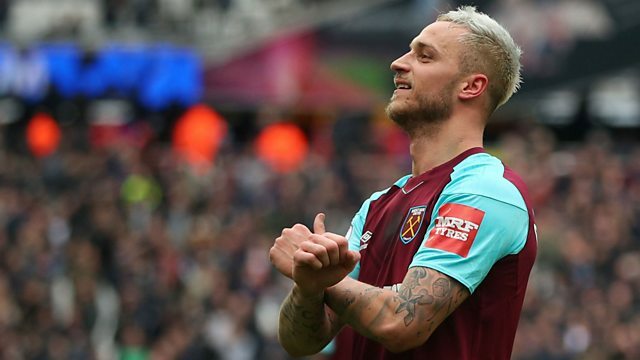 Those are the thoughts of one happy West Ham fan after Marko Arnautovic produced a memorable performance to inspire the Hammers to a 3-1 win over Southampton. You’ll also hear from both Jurgen Klopp and Jose Mourinho after Liverpool and Manchester United flip-flop between second and third place in the Premier League after wins over Crystal Palace and Swansea City respectively. At the opposite end of the table we speak to Alan Shearer and Rafa Bentiez as Newcastle picked up a precious three points with a 1-0 win over fellow strugglers Huddersfield, plus Alan Pardew is asked if his West Brom players have given up the fight after their 2-1 loss to Burnley leaves the Baggies 10 points adrift at the bottom of the league.